I have been eagerly awaiting Hallie Rubenhold's new book The Five for months. Because, well, it's no secret that I'm into historical true crime; Anthony jokes that if he were to die in mysterious circumstances I would be convicted on the strength of my Kindle library alone. And there is no case, except perhaps that of Elizabeth Short - the so called 'Black Dahlia' - that fascinates me as much as the unsolved murders of Jack the Ripper. For me it's not really the whodunnit aspect, though I do enjoy reading all the theories and their proponents reasoning, because it's 99.99% certain we're never going to know. Not beyond reasonable doubt at any rate. What is interesting is how those murders were committed without the 'Ripper' being caught. The context of the times and the environs, and how in the heart of the most disgustingly overpopulated slums in the country five (seven, eleven, more - depends on who you're talking to) women were slaughtered without anyone noticing. How those women came to encounter Jack's knife in the first place. None of them were born into the kind of life contemporary preachers and do-gooders shocked their audiences with tales of. Most were well educated by the standards of the time, and had circumstances been different they could have expected to lead long comfortable and, more importantly to the Victorian mindset, respectable lives. 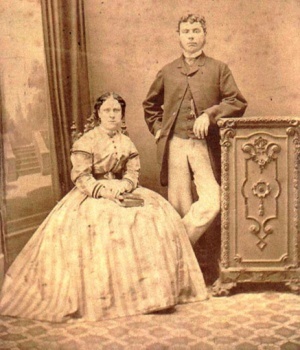 Annie Chapman (nee Smith) and her husband, c. 1869. Originally published in Neal Shelden's The Victims of Jack the Ripper in 2001. What Jack the Ripper teaches us is the inherent unfairness of the Victorian world. The gender inequality that made it so difficult for women to support themselves, and the lack of a safety net which saw these women fall so far and so fast to the squalor of the rookeries. Above all it's a story of addiction. Alcohol was both escapism and ruin and, whoever Jack was, it was alcohol which proved to be his most reliable accomplice. 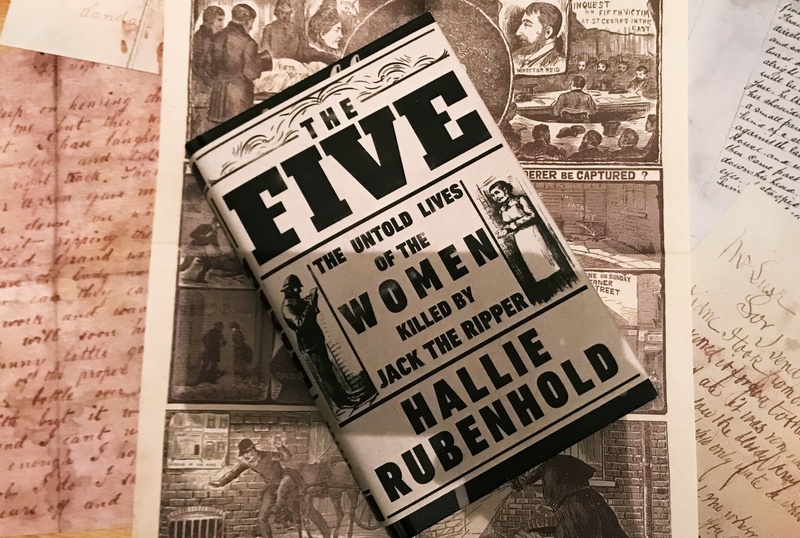 In The Five Hallie Rubenhold doesn't really reveal anything we don't already know about Mary Ann Nichols, Annie Chapman, Elizabeth Stride, Catherine Eddowes and Mary Jane Kelly. 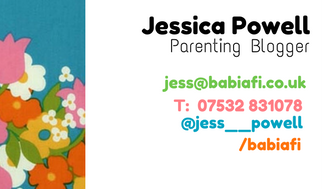 What it does do is put that information front and centre. For those who have only a passing familiarity with the case, it will be an absorbing read with plenty of background context, and offers a nice contrast to the steady churn of suspect books. For those who read anything and everything they can get their hands on, it's still good to see the backgrounds of the canonical five gathered together in one eminently readable place. On a personal level I was a little disappointed not to be wowed by new insights. When I heard this book was in the works I was particularly excited to see what an experienced professional historian would do with the reams of amateur research into the woman who called herself Mary Jane Kelly. I also wanted to know more about Rubenhold's reasoning for saying that the Ripper attacked while the victims were sleeping. (That and the reveal that they weren't all prostitutes is nothing new, despite the controversy around it. E.g. off the top of my head Bruce Paley suggested both Polly Nichols and Annie Chapman were killed while rough sleeping, regardless of their involvement in casual soliciting.) But this book isn't aimed at Ripperologists or even true crime buffs. It's a mainstream social history/biography and, of course, there's nothing at all wrong with that. What I hope it does do is inspire people who wouldn't normally be interested in the Ripper case to pick up where Rubenhold leaves off, because there are so many interesting research opportunities connected with it. 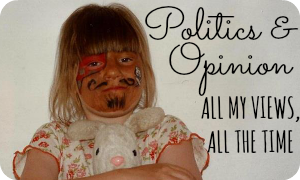 Policing, housing, activism, clothing, discrimination, linguistics, the media, mass hysteria - whatever your interests, chances are there's an angle to run with! Pick up a copy of The Five for yourself in hardback (£11.28) or on Kindle (£9.99). 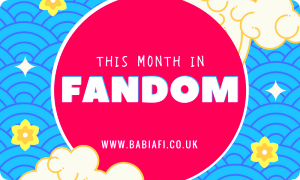 Or, fill out the Gleam widget below for a chance to win a hardback copy.